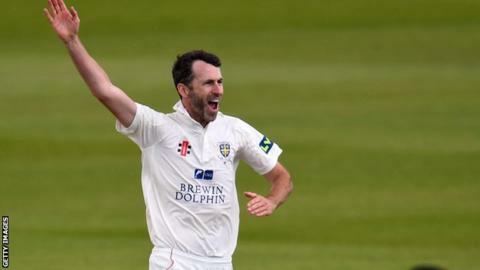 Graham Onions claimed a five-wicket haul to help Durham have the better of day one against Nottinghamshire. Notts slumped to 73-7 before Luke Wood (65 not out) Steven Mullaney (63) shared an eighth-wicket stand of 92. Onions took 5-56 as the hosts were dismissed for 204 in 54 overs, which meant Yorkshire were crowned county champions for the second year in a row. The visitors won the toss and invited Notts to bat on an overcast day and Jake Libby, playing in his first game of the season after recovering from a cruciate ligament injury, fell to Chris Rushworth (2-15) in the first over for a second-ball duck. Onions got rid of Brendan Taylor and Michael Lumb, both for one, with the hosts slipping to 7-3 in the sixth over and Riki Wessels (13) then became a first wicket for 22-year-old Durham debutant Barry McCarthy (2-51). McCarthy dropped Mullaney, who was on 41 at the time, in the deep, but later trapped the former Lancashire player leg before. Wickets continued to fall and it was only the partnership of Mullaney and Wood - who passed fifty for the third time this season - which pushed Notts past 200 and earned a single batting bonus point. Durham started at pace in their reply with Stoneman and Jack Burnham putting on 78 for the first wicket in 15.5 overs. Stoneman, who was caught by Mullaney off Jake Ball, and Borthwick, who reached his ninth half-century of the season, then put on a second-wicket partnership of 53 as the hosts reached the close in a strong position. It meant Notts wicketkeeper Chris Read still requires two dismissals to become the 26th player in history to reach 1,000.